As a White man I can recall only a few times in my life when I have been viscerally aware of the color of my skin. The first was when I visited the Bahamas with my college roommate, who had grown up there. I was uncomfortably self-conscious. Still, this was the first time it occurred to me that being perceived and treated differently along racial lines is what my roommate and friend experienced every day. Years later, I traveled to Ghana and heard little kids calling out, “Obruni! Obruni!” when they saw me. The term is the Twi word for “foreigner,” and usually is translated colloquially as “White person.” Although I had read that the expression is not meant derogatorily, I could not shake the feeling of being acutely cognizant of my identity. Such incidents made it starkly evident to me that I have an extremely limited understanding of the lived experiences of people of color. I never have had to deal with prejudice and discrimination in all its insidious forms. I never have been confronted with racially-charged aggressions. I have lived my life and I have spent my teaching career under a blanket of privilege. White students need to see more educators of color in our classrooms and schools as well. If I had more teachers of color as a student, and if, during my teacher training, issues of race and privilege were explicitly addressed, perhaps I would have been more mindful of how identity as a White teacher has shaped my perceptions. I would have read Jonathan Kozol’s Savage Inequalities and Ralph Ellison’s Invisible Man less as social discourses that seemed distant and inconceivable and more as reflections of reality. I would not have been so taken aback the first time a student addressed me as “Mister” without my surname, as I had learned to expect. I would have been more unequivocal in explaining why “All Lives Matter” is a perfunctory, misguided rebuttal to “Black Lives Matter.” I would have been more aware of how the hidden curriculum of our educational system inherently favors some students and marginalizes others, and I would have been more aggressive in questioning such institutional practices. Perhaps because of the tenor of our times, the sign received quite a response on social media, from colleagues, and from students. 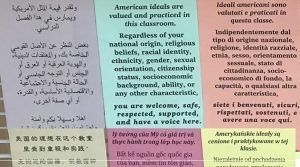 As determined and proud as I am to stand by these principles and to ensure that such beliefs are embraced and carried out in my classroom and school community, I am also dismayed to feel the need to proclaim them. Still, simply display these words means very little if they are not supported by action: initiating discussions with students and colleagues, calling out bigotry, advocating for fair policies, and taking a stand against injustices. Among the most important first steps that White teachers can take to upend the status quo is to “acknowledge the difference that difference makes,” as 2012 Maryland Teacher of the Year, Josh Parker, suggests in a recent video. Parker means that, among other measures, White teachers must recognize and confront their own views and biases. Although unnerving, it is necessary if we want to move from rhetoric to action. NNSTOY’s Courageous Conversations About Race in Schools provides an introspective starting point for those seeking to spark dialogue and further thinking about the role of race in our schools. 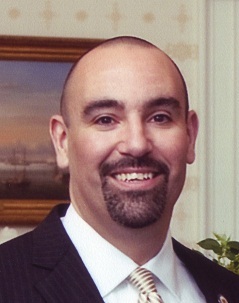 David Bosso is the 2012 Connecticut Teacher of the Year and a member of the National Network of State Teachers of the Year (NNSTOY). He teaches Social Studies at Berlin High School in Berlin, Connecticut.